The touch-move rule in chess specifies that, if a player intentionally touches a piece on the board when it is his turn to move, then he or she must move or capture that piece if it is legal to do so. This is a rule of chess that is enforced in all games played in over-the-board competitions. The player claiming a touch-move violation must do so before making a move. If a player wants to adjust a piece on its square without being required to move it, he or she can announce j’adoube ("I adjust") before touching the piece (Hooper & Whyld 1992:425). A player may not touch the pieces on the board while it is their opponents turn. There is a separate rule that a player who lets go of a piece after making a legal move cannot retract the move. If a player having the move touches one of his or her pieces as if having the intention of moving it, then he or she must move it if it can be legally moved. So long as the hand has not left the piece on a new square, the latter can be placed on any accessible square. Accidentally touching a piece, e.g. brushing against it while reaching for another piece, does not count as an intentional touch. If a player touches a hostile piece, then he or she must capture it if the piece can be captured. If a player touches one of his pieces and an opponent's piece, he or she must make that capture if it is a legal move. Otherwise, he or she is required to move or capture the first of the pieces that he or she touched. If it cannot be determined whether he or she touched his or her own piece or the opponent's piece first, it is assumed that he touched his or her own piece first. If a player touches more than one piece, he or she must move or capture the first piece that can be legally moved or captured. An exception to that is an attempted illegal castling; in that case the king must be moved if possible, but otherwise there is no requirement to move the rook. When castling, the king must be the first piece touched. If the player touches his rook at the same time as touching the king, he or she must castle with that rook if it is legal to do so. 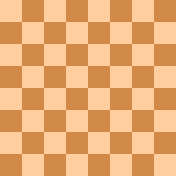 If the player completes a two-square king move without touching a rook, he or she must move the correct rook accordingly if castling in that direction is legal. Otherwise, the move must be withdrawn and another king move made. When a pawn is moved to its eighth rank, once the player takes his hand off the pawn, it can no longer be substituted for a different move of the pawn. However, the move is not complete until the promoted piece is released on that square (Just & Burg 2003:20-23). In the diagram at left, from a game between future World Champion Bobby Fischer and Jan Hein Donner, White had a probably winning advantage; Black had just moved 29...Qg5-f5 and White fell for a swindle. Fischer touched his bishop, intending to move 30.Bd3, which seems like a natural move, but then realized that Black could play 30...Rxc2, and after 31.Bxf5 Rc1 32.Qxc1 Bxc1, the game would be a draw, because of the opposite-colored bishops endgame. After touching the bishop, he realized that 30.Bd3 was a bad move, but since he was obligated to move the bishop, and other bishop moves were even worse, after several seconds he played 30.Bd3. The queens and rooks were exchanged (as above) and a draw by agreement was reached after the 34th move. Had Fischer won the game, he would have tied with Boris Spassky for first place in the 1966 Piatigorsky Cup tournament (Kashdan 1968:49-50). Fischer now touched his h-pawn, compelling him to play 12...h6?? or 12...h5?? The touch-move rule produced an even more disastrous result for Fischer in his game as Black against Wolfgang Unzicker at Buenos Aires 1960. In the position diagrammed at right, Fischer touched his h-pawn, intending to play 12...h6. He then realized that, because of the pin on the g-file, White could simply play 13.Bxh6; 13...gxh6 would be illegal, since it would put Black's king in check by White's queen. Having touched his h-pawn, the touch-move rule required Fischer to play either 12...h6?? or 12...h5? ?, an almost equally bad move that fatally weakens Black's kingside. Fischer accordingly played 12...h5?? and resigned just ten moves later - his shortest loss ever in a serious game (Mednis 1997:110-11). Black moved 53...Kd6+, White touched his queen. In this position in a rapid game in Tilburg in 1992 between former World Champion Anatoly Karpov and Alexander Chernin, White had just promoted a pawn to a queen on the e8 square. Black made the discovered check 53...Kd6+. Karpov, with very little time remaining, did not see that he was in check and played the illegal move 54.Qe6+. The arbiter required Karpov to play a legal move with his queen instead (since he touched it), and he selected 54.Qe7+?? (54.Qd7+ Rxd7+ 55.Kg6 would still have drawn (Fox & James 1993:198)). After 54...Rxe7+, Karpov lost the game (McDonald 2002:224-25). Black touched his king's bishop, mistakenly thinking White had played 5.d2-d4. In the 1889 game between Siegbert Tarrasch and Semyon Alapin at Breslau, Alapin was expecting 5.d4, the normal move after 1.e4 e5 2.Nf3 Nf6 3.Nxe5 d6 4.Nf3 Nxe4 in Petrov's Defence. But by the time he looked at the position he had already touched his king's bishop, intending 5...Be7 in reply to the usual 5.d4, not noticing that White actually played 5.d3 (attacking the black knight). Now compelled to move the bishop, he would lose the knight, so resigned immediately (Chernev & Reinfeld 1949:111). If a player wishes to adjust the pieces on their squares without being required to move or capture the piece, he or she can announce j’adoube , (French: I adjust), or words to that effect in other languages. J’adoube is internationally recognised by chess players as announcing the intent to make incidental contact with their pieces. The phrase is used to give warning from a player to his or her opponent that he or she is about to touch a piece on the board, typically to centralise it on its square, without the intent of making a move with it. Although this French term is customary, it is not obligatory; other similar indications may be used. A player may adjust a piece in this way only when it is his turn to move. There have been occasions in chess history when a player has uttered j’adoube after making a losing move in order to retract it, thus attempting to avoid the touch-move rule. Such behaviour is regarded as cheating (see cheating in chess). The Yugoslav Grandmaster Milan Matulović was nicknamed "J’adoubovic" after such an incident (Hooper & Whyld 1992:185,252) (Lombardy & Daniels 1975:104). While this rule existed, it occasionally led to tragicomedies such as in the 1893 game between Lindermann and Echtermeyer, at Kiel. In that game, after 1.e4 d5 2.exd5 Qxd5 White, probably intending the usual 3.Nc3, instead placed his queen's bishop on c3. Since that move was illegal, White was compelled to instead move his king. After the forced 3.Ke2? ?, Black gave checkmate with 3...Qe4# (Chernev 1974:119). In England, the 1862 laws of the British Chess Association rejected the above rule. The Association's Law VII provided instead that if a player made an illegal move, "he must, at the choice of the opponent, and according to the case, either move his own man legally, capture the man legally, or move any other man legally moveable." (Gossip & Lipschütz 1902:31) (Steinitz 1889:xxi). The German chess master Siegbert Tarrasch wrote in The Game of Chess (originally published in 1931 as Das Schachspiel) that the former rule requiring a player who made an illegal move to move his king had only been changed a few years earlier (Tarrasch 1938:37).